CD DVD Labels CLEAR Glossy No-Wobble Inkjet, Avery compatible layout, 100 labels in each Pack . These labels are completely clear. Our "frosty white" no-wobble labels are no longer available. Ultra-thin permanent labels - will not wobble or peel off! Our bulk clear CD/DVD Inkjet Label Refills. Special ultra-thin clear inkjet printable composite plastic inkjet labels will adhere permanently to discs, preventing the curled edges and playback wobbling errors you could experience with older, thicker labels. These improved thinner labels also minimize possible high-speed CD-R playback problems that are caused by old-style thicker labels being applied even slightly off-center. APPLICATION TIPS -- Clear plastic labels are more difficult to apply than white paper labels. If the label is applied incorrectly, there can be air bubbles trapped under the label. To help minimize this problem, you may wish to experiment by gently warming the label after being removed from the paper with a hair dryer set to 'warm' mid-range heat (not the hot setting). This will relax the plastic and enable smooth application. Hold the label sticky side out, making a loop where you've loosely folded the label so that opposite edges are touching. Then lower it carefully onto the disc so that the label's center hole is exactly aligned with the disc's center hole. Finally, use a slender straight edged tool such as a long thin ruler or pencil to smooth the label down onto the disc, starting at the center and moving out toward first one outside edge and then the other. A little practice can help you do this without creating bubbles. RECOMMENDED DISC TYPES -- These labels are made from a special polymer combination material that cannot withstand high heat from many laser printers, so they are recommended for inkjet printing ONLY. Be sure to use only with blank surface discs, without any brand or other imprinting. White topped discs are recommended if you're using full color designs. (Such as our 1x-2x DVD-R Stock Nos. 702740W or 702886, and our 4x-1x DVD-R Stock No. 702277.) Silver topped discs can be used if you're only printing text in solid colors, or for simple line-art and text, where the silver background provides a slick high-tech look (such as our 1x-2x DVD-R Stock Nos. 702757 or 702991, and our 4x-1x DVD-R Stock No. 702588.). Fast drying inks are required. Use printer settings for high-gloss, polished surfaces. Avoid using heavily saturated, multi-ink colors such as browns and purples when possible. 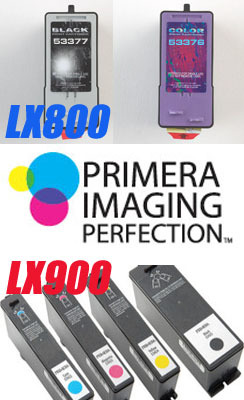 If too much ink is applied, combining several colors from different cartridges, the thinner material will not be able to absorb the excess ink. A little experimentation with different color combinations can produce excellent image results. 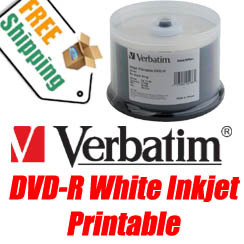 DVD Recommendations -- The best way to print your DVDs is with a direct to disc printer, such as the EZ CD Printers sold here in our store, starting as low as $240 and up (Search for "ez cd" in the search box on our front page). However, if you do decided to use labels, you will need to find the very lightest weight labels you can, to avoid wobbling and disc playback errors. We recommend that users wanting to apply labels to their DVDs try the excellent quality Avery Afterburner Clear Inkjet Labels - Stock No. AVR08844, usually priced under $20. These are light weight, clear inkjet printable labels for regular inkjet printers. Their tabbed, full face special design is for use with the $25 Avery Afterburner Applicator Tool only - Stock No. AVR08831. This applicator kit includes software, templates and sample paper labels, but no clear labels are included, so you need to order at least one pak of the clear labels. 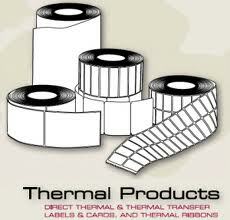 You will be amazed at the easy of use and quality of these labels. Software is available for Windows and Macs in the kit above.